Now, Myanmar government agreed with Singapore company to do SEZ, Special Economic Zone at Rakhine, Sittwe where Shwe Gas industry, China Gas Pipeline start. This is third SEZ in Myanmar. 1st SEZ is Thilawa (by Japan), 2nd SEZ is Dawai. But who is the Myanmar leaders of those SEZ is important. Old men leaders must change attitude with tears. 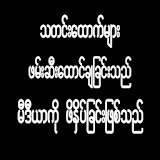 With tears of Myanmar leaders, our poverty will be gone. KILL the crocodile style leaders. Do not allow them to drop their tears.